The Miracle of Birth Center is celebrating its 19th year and is staffed by volunteer veterinarians from the Minnesota Veterinary Medical Association, veterinary students from the Veterinary Teaching Hospital at the University of Minnesota, and members of the National FFA organization. 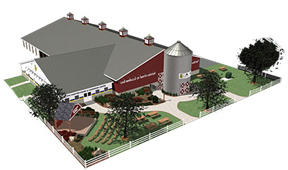 This display, the most popular attraction at the fair, educates the public on the vital role that animal agriculture and veterinary medicine play in the state of Minnesota. With live births and newborn farm animals, including cows, pigs, chicks, sheep, and ducks, the display highlights the importance of animals to our economy, health, and quality of life. Volunteers are needed to answer questions and help in the birthing process. Many of your clients visit this exhibit, and they would be excited to see "their" veterinarian at work. This is also an excellent opportunity for large animal veterinarians to interact with students and the public, and recruit them into the large animal field. Each year our volunteers remark that this is an experience they will never forget! Already a volunteer? Make sure to download the protocols and complete communications guidelines before arriving at the Miracle of Birth Center. Just click on the links below, and print out each sheet.